Neighbors: awareness and reporting are key! Please be wary of potential predators. Use our social media outlets to report any tips you may have. Can’t access social media? Then leave a comment on any story. We will use that to contact you directly if needed. On 8/13/18, a middle-aged white male was seen circling the block at least 17 times in the Fairmount area across from the playground and near the pool. He has white hair, heavy set, and was wearing a salmon colored, collared shirt. He was driving a small, light green SUV. 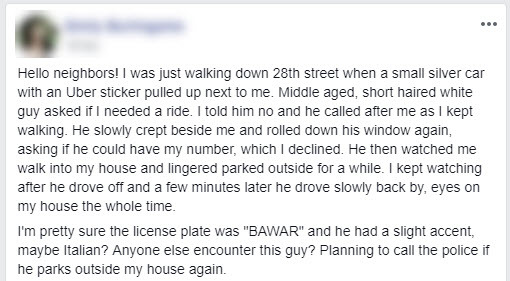 He was stalking a teenaged girl who was caring for a baby and just happened to be outside on a walk. Thank goodness for the kindness of neighbors who stepped in and helped this girl and child until the police arrived. They were able to give a good enough description and get a photo of the vehicle so that the police were able to stop him. The police questioned him and he said he was looking to solicit a prostitute. This all happened between about 3:30pm and 4:15pm. According to the police, he was just arrested in June for soliciting in the same area and is from Henrico County. Please be aware of your surroundings and be careful! 1. Reduce or eliminate opportunities that may make you a target. 2. Increase awareness in places where you’re most comfortable. 3. Trust your instincts even if you feel embarrassed. 4. Prepare your schedule daily with safety in mind. • Be AWARE of your surroundings at all times and trust your INSTINCTS. • Stay in well lit, populated pathways. Avoid shortcuts. • Travel in groups. There’s always safety in numbers. • Walk with your head upright. Make eye contact. Thieves often target victims who are not paying attention to their surroundings or who are looking down. • Pay attention to your surroundings when using electronics on the streets and buses. Don’t TUNE yourself out. DON’T WALK AND TEXT. • Change the color of your earphones from “White” to any other color. White earphones usually indicate that you have an APPLE DEVICE which is an attractive target for thieves. • Avoid traveling through parks after dark. • Before entering your apartment building, have your keys ready. Don’t hold doors for anyone whom you don’t know. If you are in danger or actvely witnessing a crime call 911. If you simply have a tip on a crime that has been committed you can contact crime stoppers. 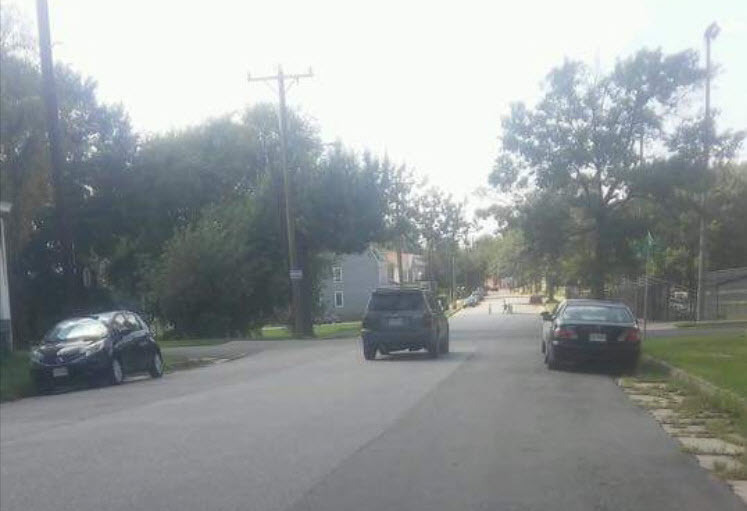 Contact Crime Stoppers at (804) 780-1000 or online at www.7801000.com. You can also use the P3 Tips Crime Stoppers app for smartphones. All Crime Stoppers methods are anonymous. Two weeks ago I notified CHPN of the graffiti on the houae under renovation at 27th and East Grace. A large section of the upper right brick was spray painted with silver paint. Extremely difficult to remove! This probably would not have happened if the workers had not left ladders up for over a week and over the weekend. Are there any security cameras in that block?